The Pelican Advantage Series Salt Water Softener provides softened water using salt or potassium. All Pelican Advantage Series salt-based water softeners are metered and only backwash when needed to waste as few gallons as possible. As water passes through the mineral tank, the positively charged calcium and magnesium ions are lost to negatively-charged plastic beads. The brine tank holds a solution of water and salt that flushes the mineral tank and replaces the calcium and magnesium ions with sodium. Recharging cycles are controlled by the meter on the top of the tank (normally once every 7 days). Q. Why should I choose the Pelican Water Softener over the others on the market? The Pelican line of water softeners is designed with the highest quality materials on the market today. 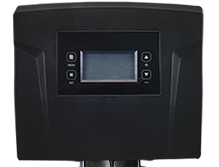 Pelican Water Softeners utilize the top of the line electronic heads along with features that save you time and money. Quality costs more to make, we would rather build quality than apologize for its absence. Pelican Water Technologies is a leader is advanced water treatment and is dedicated to the future of water treatment methods and ways to improve water for the end user. Q. Can the Pelican Water Softeners be installed outdoors? Pelican water softeners should be protected against the weather when they are installed outside. The electronic head should be shielded from water. The decision to install a water softener outside depends on the part of the country you live in. For example, if it seldom freezes, it may be acceptable to install a water softener outside, but sun, wind, and rain can still reduce their longevity. Ultraviolet light can damage the plastic components, while rain and high humidity have an undesirable effect on the electronics and mechanical parts. If you decide to install a water softener outside, it is advised to protect it from the elements with a weatherproof cover or cabinet. Q. How long does the resin last in the Pelican Water Softeners? Resin life depends on several factors, including the amount of chlorine, quality of resin, and number of regenerations. The average life of resin is typically 7-15 years. If the chlorine is removed from the water with a carbon pre-filter such as the Pelican PC600 or PC1000, thereby preventing it from reaching the resin, the resin could last up to 25 years. While a water softener resin bed normally can last as long as 15 years, iron in well water and excessive amounts of chlorine in city water can damage a resin bed. If your water softener is using up salt at its regular rate and water is no longer being softened, the resin bed is likely saturated with iron deposits or damaged by chlorine. When this happens, it can no longer be regenerated by the brine and needs to be replaced. Yes, potassium chloride can be used instead of salt. While potassium chloride is a more expensive alternative, it is well worth the cost when you consider the benefits. According to the Mayo Clinic, levels of sodium in drinking water are very low in most water systems. An Environmental Protection Agency survey found the majority of water softener systems tested contained less than 50 mg sodium per liter. Based on this data, a fourth of a liter (about an 8-ounce glass) of water would contain less than 12.5 mg of sodium, which falls within the Food and Drug Administration's definition of .very low sodium.. Individuals on a very low-sodium diet who are concerned about the amount of sodium in softened water should consider a water-purification system that uses potassium chloride instead of salt. Q. Will the Pelican Water Softeners remove iron from my water? Yes, Pelican Water Softeners will remove all ferrous iron (Fe++) or clear iron. If other types of iron are present in your water, the Pelican Iron Removal Filter is recommended in addition to the Pelican Water Softener, because oxidized forms of iron in raw water will damage the softener resin. Iron in drinking water is not considered a health hazard but it tastes bad and leaves an unsightly residue anywhere you use water in your home, such as the washing machine or toilet. Soluble iron leaves behind a reddish brown residue on glasses and sinks. Insoluble iron can cause water to take on an unsightly rusty red or yellow hue. In well water, the majority of iron occurs in its ferrous state. Iron removal from water is accomplished the same way other minerals are removed, by exchanging the iron with salt/sodium. Then the iron is removed from the softener resin bed through backwashing and regeneration. The efficiency of a water softener in removing iron depends to some extent on the iron concentration, water hardness, and pH level of your water. Even ferrous iron can clog and foul the softener resin, so periodically, a resin cleaning compound should be used to remove iron particles. Q. How much salt is added to my water from the Pelican Water Softeners? It depends on the hardness level of the original water. For example, drinking a quart of softened water with a hardness of 20 grains of hardness will add 150.0 milligrams/quart, of sodium the equivalent of less than a tablespoon of ketchup or a slice of white bread. With all brands of water softeners there will be a pressure drop. The Pelican Water Softeners are of the highest quality available on the market therefore the pressure drop will be very low compared to most other brands. According to the Water Quality Association Technical Papers concerning septic tanks, ect. Concerns about salt and soil absorption rates were dispelled. The increased sodium content in the tanks discharge was shown to have no detrimental effect on the soils ability to absorb water in a normal drain field. Interestingly, certain soil conditions benefited from it. Additionally, when the softener's calcium-rich regeneration backwash emptied into the septic system, the discharge could actually improve the soils percolation. The conclusion drawn from these tests is that the softened water is not harmful to a normally operating septic system or drain field. As long as the water pressure at the softener is not less than 40 PSI and the run of the drain line does not exceed 15, your discharge line may be elevated up to 4 above the system. For each additional 10 PSI of water supply the line can be elevated an additional. If you are using sodium chloride to regenerate the resin, over time, softened water can be harmful to plants and other vegetation. It is recommended that outside faucets be bypassed from the softener. Most plants cannot withstand high amounts of salt. The sodium in softened water interferes with the water balance in plants, tricking them into thinking they have absorbed more water than they actually have. So softened water causes plants to die of thirst. In addition to installing a bypass spigot on outdoor faucets, mixing softened water with rainwater to water your plants dilutes sodium levels and is less harmful to them. Salt buildup in soil results from using brine-based softened water. This is also harmful to grass, so it is not recommended for irrigating lawns or gardens. A typical home with a family of 4 with 2.5 bathrooms and a hardness of 10 will require a 32,000 grains softener that will regenerate every 11 days. The softener uses about 9 lbs of salt per regeneration, so if your brine tank is full (375lbs) from the start, you will not add salt for about 10 months. No, the Pelican Water Softener System comes complete with and 1 copper and CPVC plumbing fittings and also a drain line for your convenience. Q. Does the softener filter out chlorine and chemicals from my water? No, the Pelican softener is a water softener/conditioning system. Its sole purpose is to deal with the hardness in your water and not the contaminants. If you are interested in filtering chlorine and other chemicals from your water, you may want to consider the Pelican Whole House Water Filter and Softening Combo. Carbon-based whole house filter systems are the most economical solutions. High quality systems can effectively remove sediment, rust, and other large contaminants, harsh disinfectants such as chlorine and chloramine, as well as lead, mercury, nickel, and other dissolved metals. Carbon/activated carbon filters also can remove dangerous organic compounds (such as VOC.s). It.s important to only buy a water filter that is NSF-certified and one that lists the testing done in the certification process. All systems come standard with high capacity resin tanks, and a 5-year warranty on the electronic head. If you are looking to purchase a salt-based system and you want the very best then the Pelican Advantage Series is your answer. Metered Delayed Backwash for Minimal Water Waste, Only Backwash When You Need To! Meter Immediate - When the Water Volume Remaining display has reached zero gallons, a regeneration cycle will be initiated immediately. Meter Delayed - When the Water Volume Remaining display has reached zero gallons, a regeneration cycle will be initiated at the preset Regeneration Time Of Day chosen during setup (i.e. 1:00 am). Time Clock Delayed - When the valve reaches its set Days Since Regeneration, a regeneration cycle will be initiated at the preset Regeneration Time Of Day chosen during setup (i.e. 1:00 am). This event occurs regardless of the Water Volume Remaining display having reached zero gallons. Are you buying a salt-based softener? Please consider adding an RO. Pelican Limited Lifetime Warranty on all filter housings, tanks, and the bypass valves against manufacturer's defects. Solid State Electronic head comes with a 7 year manufacturers warranty..